Michael I. Verde is partner and head of the firm's Insurance and Risk Management practice and General Counsel to the firm. His practice encompasses counseling and litigation related to insurance, risk management and fraud, with particular experience in the financial and hotel industries. Michael has argued trial and appellate cases in both state and federal courts, as well as in arbitrations before the American Arbitration Association (AAA) and the International Court of Arbitration of the International Chamber of Commerce (ICC). He has significant experience handling international matters, having investigated and litigated matters arising in Europe, Asia, Africa, South America and the Middle East, in addition to jurisdictions throughout the United States. Michael represents both insurers and policyholders in large, complex coverage and defense litigations involving fidelity losses, professional liability, directors' and officers' liability, business and contingent business interruption claims, mass tort, catastrophic property loss, airline liability and technology claims. 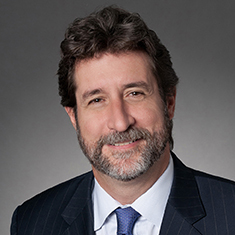 He has also litigated matters within the insurance industry, including regulatory enforcement actions, reinsurance claims, broker negligence and program manager disputes. He regularly reviews clients' insurance policies to ensure that their businesses are receiving appropriate coverage for the risks they are likely to face. Michael also handles complex fraud claims for both domestic and foreign clients, initiating criminal prosecutions in addition to civil recoveries. Prior to becoming an attorney, Michael served as a sergeant in the New York City Police Department. After practicing as an attorney for a number of years, he took leave from the firm to head the New York office of a London private investigation company. Michael relies on this unique experience to lead investigations and provide advice for clients that have been victimized by fraud, especially frauds originating in foreign jurisdictions. Michael has particular experience in the hotel industry and represents domestic and international hotel owners in disputes with management and franchise companies regarding management fraud, negligence and breach of contract pertaining to the construction and operation of hotels. He also has particular experience in the financial services industry, having worked with many banks, hedge funds, investment funds and brokerages in tailoring their insurance policies to the unique risks they face, litigating disputed claims, and investigating and litigating internal and external incidents of fraud.